Four games to go as the Germany Bundesliga continues this weekend but it is getting tighter at the bottom of the log just as it is from second to seventh at the top. The battle for European places rages on, and, so does the fight against relegation; – this could have Koln and Hamburg drawn out of German top-flight football before next week. Safe to say the dream seems a bit further from the bottom two’s reach than it was last week. On another end, Dortmund suffered a 2-0 defeat and now trails Schalke 04 by four-points, just in case second position was anywhere too close for Peter ‘Stable’ Stoger’s men lying third. 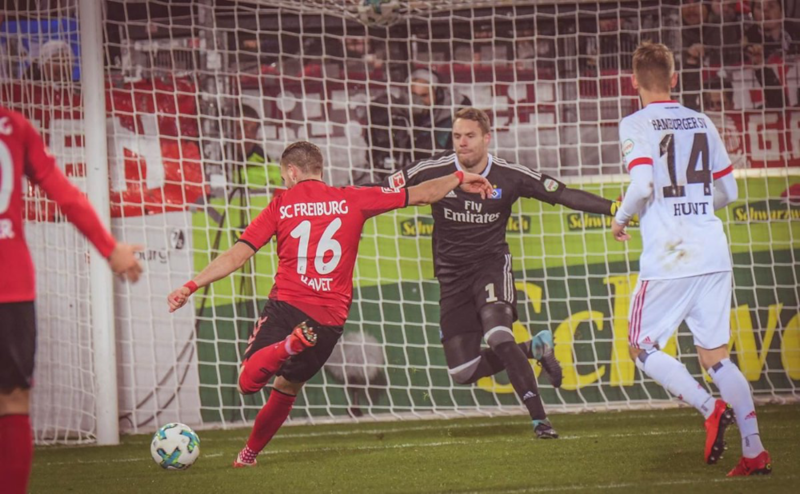 Hamburg v SC Freiburg Live on Sanyuka TV and Sports Focus – StarTimes. Hamburg faces relegation should they lose their crucial home game to SC Freiburg this weekend. Der Dino suffered a 2-0 loss to TSG Hoffenheim off a 3-2 win against second placed Schalke in their last match at the Volksparkstadion. That’s why their fight for survival can well be described as a turbulent one. Meanwhile, SC Freiburg have lost four straight matches and have slipped into the relegation play-off spot as a result, with only one win away from home. A defeat against fellow ‘red-zone’ rivals could be worse for the Baden-Württemberg based side. Christian Titz’s side welcome back Kyriakos Papadopoulos from a one-match ban and could replace Rick van Drongelen at centre-back. But, Douglas Santos will be out with a one-man Suspension. Dennis Diekmeier and Nicolai Müller are still nursing ankle injuries as Sven Schipplock continues to recover from a pulled muscle. Meanwhile, Freiburg will miss Caleb Stanko who’s out with a knee injury and the same goes for Amir Abrashi and Niederlechner. Expect a hard fight for survival since this match holds much more than just the three points. Julian Pollersbeck; Gōtoku Sakai (c) – Gideon Jung – Papadopoulos – Van Drongelen; Lewis Holtby – Ville Matti Steinmann – Aaron Hunt; Kostic – Waldschmidt – Tatsuya Ito. If Hamburg lose and Mainz (away to Augsburg) and Wolfsburg (away to Borussia Mönchengladbach) win, the Dinos will be relegated. A win, on the other hand, would take HSV to within five points of the relegation play-off spot with games against Wolfsburg (a), Eintracht Frankfurt (a) and Borussia Mönchengladbach (h) to come. HSV’s 18-year-old striker Arp became the first millennial to score in the Bundesliga earlier in the season but is currently 15 matches without a goal. Based on the last five games, Freiburg sit bottom of the Bundesliga form table on one point. Petersen has scored four goals in 10 career appearances against Hamburg, but only one in four meetings as a Freiburg player. Streich has faced Hamburg ten times as Freiburg coach, winning three, drawing six and losing one. The 52-year-old is unbeaten in his last six against the northern club. Do not miss the Bundesliga on StarTimes, please follow the fixture listing below for the Bundesliga matches this weekend.